airpalette ATFM predicts the air traffic volume of the airspace and airport of a few hours later based on the flight plan provided by the airline and the meteorological data. If the flight plan is unavailable, airpalette ATFM can use data from the OAG (Official Airline Guide) which has a timetable of scheduled flights all over the world. When congestion is predicted in the air traffic volume, the traffic flow will be managed by adjusting the arrivals and departures schedule. 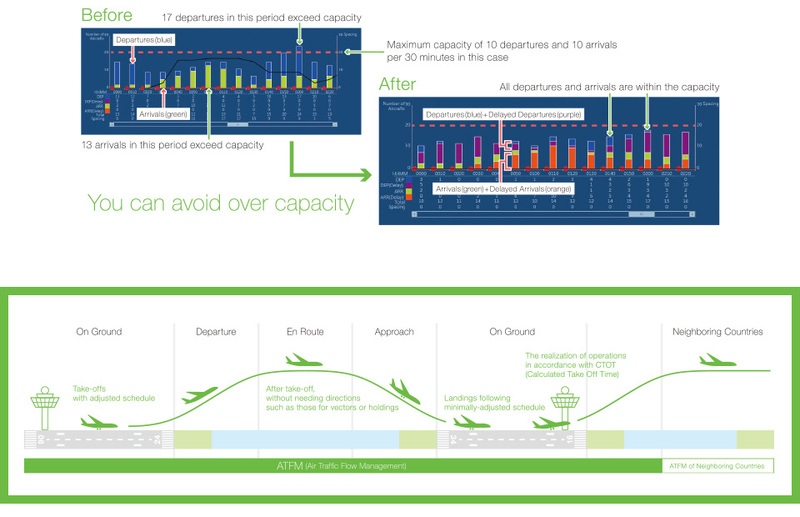 Many variations of control patterns are provided in order to calculate the ideal departures schedule. As well as testing the practical results of multiple patterns, the user can carry out the control patterns. We are also planning improvements such as calculation of Estimated Passing Time at trajectory fix and Estimated Arrival Time with weather conditions and aircraft performance. International ATFM is the exchange of information between countries with adjacent airspace, and the adjustment of departure and arrival times or to the entry and departure from the airspace under national jurisdiction, in order to manage air traffic flows in the best way for both countries. Our product is designed with international ATFM in mind, and contributes to the prompt start-up of international ATFM by sharing the necessary information. We provide full installation support from consultation to training.